Structures 1 and 2 (Table 4.7) are from reasonably recent reports (1993) concerning metal thermal protection systems (TPS) with current advanced titanium and metal matrix composite materials. Structures 3, 6, 7, 8, 9 and 10 are from the Hypersonic Research Facilities Study (HyFAC) conducted for NASA by McDonnell Aircraft Company, Advanced Engineering Department, from 1968 to 1970. One of the authors (PC) was the Deputy Study Manager for that program. Except for structure 3, which anticipated the developments of advanced titanium, metal matrix composite materials and high-temperature plastic matrix materials, the other concepts employed high-temperature chrome-nickel alloys, and coated refractory metals for the thermal protection shingles that enclosed vacuum multilayer insulation. Structure 9 was an effort to minimize the cost of a short flight time research vehicle (5min) at the expense of increased weight by using more readily available high-temperature materials. Structures 4 and 5 were the work of the late Jean Vandenkerckhove (VDK) and the author to characterize the high-temperature metal and ceramic materials available in Europe. Carbon/carbon, silicon carbide/carbon and silicon carbide/ silicon carbide structural material from SEP, Bordeaux (now SAFRAN/ SNECMA, Bordeaux), and metal matrix composites from British Petroleum, Sudbury, along with the conventional aircraft materials were characterized from material supplied by the major aerospace manufacturers in Europe. At that time no materials from the former Soviet Union were included. Notice that they center on the HyFAC structural data. These values were used in most of the work done by the authors. The two structural indices used by J. Vandenkerckhove result in an OEW, for a weight ratio 6 launcher, of 49.61 employing VDK FUTURE and 65.81 employing VDK CURRENT. 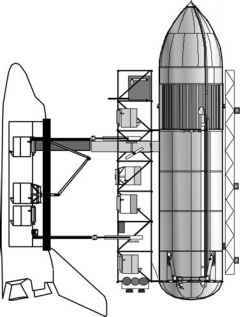 The same vehicle using 1970 McDonnell Douglas structural index is 72.1 tons, and 45.5 tons projected to 15 years in the future, to 1985. Assuming the current availability of materials and manufacturing processes is equivalent to 1970, then the vehicle empty weight is from 65.8 to 72.1 metric tons. Assuming the current availability of materials and manufacturing processes is equivalent to the 1985 projection, and from what the authors saw at SEP, Bordeaux, BP, Sudbury, and NPO Kompozit, Moscow, then the vehicle empty weight is from 45.5 to 49.6 metric tons. These values should span what is possible today much as Saturn V was constructed from what was available in 1965. The non-integral structural concepts are not competitive, resulting in an OEW of 96.5 tons for a passively insulated tank, and 163.4 tons for a hot structure concept. The 1993 results from Pegg and Hunt show some improvement in the passive structural concept (about a 5% reduction), not a critical item. The focus on future launcher must be durability over a long period of use, not one-time lightness. The design, build and operations philosophy must be akin to the Boeing B-52, not an ICBM. The cold, insulated integral tank structural concept employed in these studies remains appropriate and valid. The concept has withstood the test of many challenges, but remains the lightest and lowest-cost approach to high-temperature, hypersonic aircraft structure that was established by practice as reported in [Anon., HyFAC, 1970]. The primary structure is principally aluminum with steel and titanium where strength is a requirement. The aerodynamic surface is made by interleaved smooth shingles with standoff and insulation material that provide a high-temperature radiation surface to dissipate most of the incoming aerodynamic heating to space. Less than 3% of the incoming aerodynamic heating reaches the aluminum structure. The HyFAC data is circa 1968 and based on the materials and insulation available then. With advanced rapid solidification rate (RSR) materials and superplastic forming with diffusion bonding, together with silicon carbide and carbon fiber reinforcements to fabricate metal matrix composites (MMC) the values in Table 4.7 should be conservative. The active TPS values are from a recent source, as given by [Pegg and Hunt, 1993]. Depending on the duration of the flight that heat can be absorbed in the airframe thermal capacitor or removed by an active thermal management system (Figures 4.17 and 4.18). For some short duration (10min or less) research flights and some orbital ascent flights, no active thermal management system is necessary. For a long-duration cruise flight some means of moving the incoming thermal energy to a site where it can be disposed of or used to perform mechanical work is required. The original concept in the 1970s was implemented using high-temperature refractory metals such as columbium (niobium), tantalum, molybdenum, and Rene; 41 and other refractory alloys, which have densities greater than steel (9000 to 17,000 kg/m3). Today rapid solidification rate (RSR) titanium, RSR metal matrix composites (MMC), titanium aluminide, carbon/carbon, and silicon carbide/silicon carbide composites can achieve the same temperature performance at much less weight. The weight estimates based on scaling of the 1970 data are therefore very conservative. The concept uses conventional aircraft construction techniques for most of the aircraft; the shingles are well within the current manufacturing capabilities considering the hot isostatic pressing, superplastic forming, and diffusion bonding available in the gas turbine industry. For longer-duration flights required for long-range cruise, the advantages of active thermal management is clear. With current materials, whether actively thermally managed for cruise, or passively thermally managed for exit and entry, it should be possible in 2008-plus to build a structure for a hypersonic aircraft that is between 3.0 and 4.0 lb/ft2 (14.6 and 19.5 kg/m2) using materials and processes available now.